Cohen has been testifying before the House of Representatives Oversight Committee today. Cohen has been jailed for three years for lying and tax evasion. MICHAEL COHEN HAS testified that Donald Trump wrote a cheque to him, while president, to reimburse him for hush money paid to Stormy Daniels. In explosive public testimony to Congress today, Cohen also provided a copy of a cheque to him signed by Trump which he says was to reimburse him for payments made to Daniels, whose real name is Stephanie Clifford. Cohen was Trump’s former personal lawyer and worked closely alongside him for 12 years, becoming vice president of the Trump Organisation. He described himself today as Trump’s “fixer”. “Mr Trump directed me to use my own personal finances……to avoid money being traced back to him that would negatively affected his campaign,” Cohen said of the hush money. Donald Trump wrote you a cheque out of his personal account while he was serving as President of the United States of America to reimburse you for hush money payments to Miss Clifford? Is that what you are telling the American people today? “Yes, Mr. Chairman,” Cohen responded. 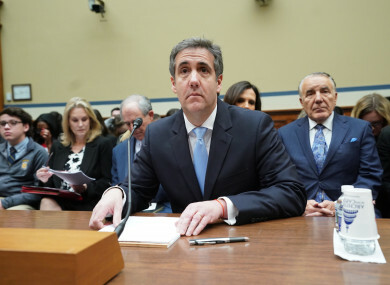 Cohen was testifying before the House of Representatives Oversight Committee on the second of three scheduled days of testimony on Capitol Hill. Yesterday’s first session at the senate was behind closed doors. Speaking to representatives, he consistently attacked Trump’s character and conduct, labelling him as “a racist”, “a conman” and “a cheat”. In December, Cohen was jailed for three years for crimes including tax evasion and for lying to Congress about Trump’s business dealings in Russia. “I am ashamed of my weakness and misplaced loyalty, of the things I did for Mr. Trump in an effort to protect and promote him,” Cohen said. Speaking today, Cohen said he would no longer lie on behalf of Trump. I have lied, but I am not a liar I have done bad things, but I am not a bad man. I have fixed things, but I am no longer your fixer, Mr Trump. Cohen: "I am ashamed. Because I know what Mr. Trump is. He is a con man. Cohen also said that he and his family have been intimidated by people connected to the president for his decision to speak about Trump. “Mr Trump called me a rat, for choosing to tell the truth, much like a mobster would do when one of his men decides to cooperate with the government,” he said. Cohen also told Congress that Trump knew ahead of time that WikiLeaks was planning to dump emails that were damaging to Hillary Clinton’s campaign. Cohen’s claims that Trump had advance knowledge of the emails contradict the president’s assertions that he was in the dark, but it was not clear what evidence Cohen had to support the allegation or even how legally problematic it would be for Trump. Special counsel Robert Mueller has not suggested that mere awareness of WikiLeaks’ plans, as Trump confidant Roger Stone is purported to have had, is by itself a crime. Email “'I have fixed things, but I am no longer your fixer, Mr Trump' - Michael Cohen delivers explosive testimony”. Feedback on “'I have fixed things, but I am no longer your fixer, Mr Trump' - Michael Cohen delivers explosive testimony”.